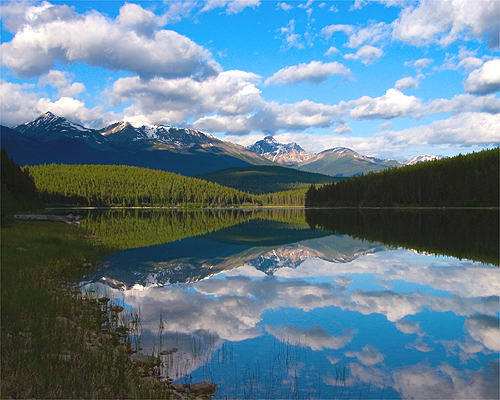 Freshwaters are found in lakes, ponds, rivers, and streams. 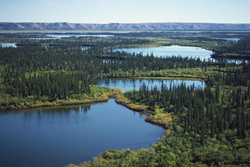 Freshwater biomes are characterized by their extremely low salt content of water and are maintained by precipitation. 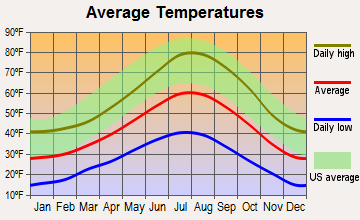 Temperature- Depending on the season, the temperature in freshwater biomes may be uniform or uneven between the different layers of ponds and lakes. During the summer, the top portion of the freshwater biome can be around 71 degrees Fahrenheit while the bottom remains cooler at 39 degrees Fahrenheit. During the winter the top portion could be at the freezing point of water and the bottom would remain at 39 degrees Fahrenheit. Because of winds, the top and bottom layers often mix with each other regulating the temperature at 39 degrees. During the spring and fall seasons, this mixing allows for oxygen circulation throughout the lake. 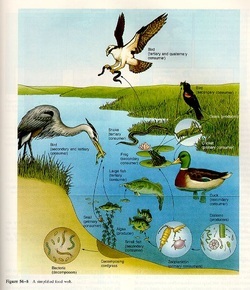 Precipitation- The water cycle plays an important role in freshwater biomes. Precipitation replenishes the water in fresh water biomes. Depending on the size of lakes or rivers, they evaporate an amount of moisture into the air which in turn is either precipitated as rain or snow which flows back down into the lakes as surface water or seeps into the soil as ground water. Water Characteristics- Rivers and streams are moving freshwater biomes. Younger rivers cut straight direct paths through the ground and rocks making them swifter than older rivers and streams. 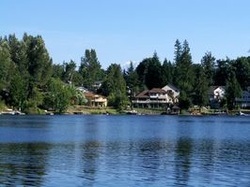 Lakes and ponds are static and non flowing fresh water bodies. 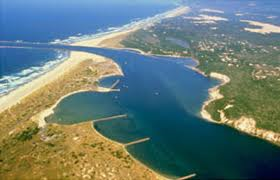 Estuaries are areas where river water mixes with ocean water that are rich with nutrients. 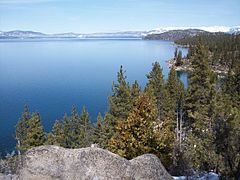 Lake Tahoe is a large lake in the Sierra Nevada of the United States bordered between California and Nevada. It is the largest alpine lake in North America. Annual Precipitation ranges from 55 inches for watersheds on the west side of the basin and 26 inches near the lake on the east side of the basin. 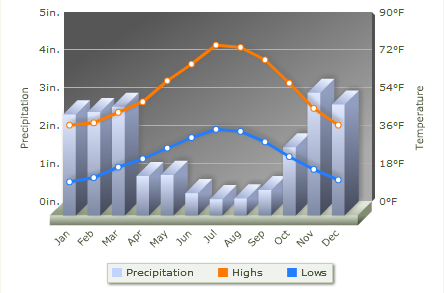 Between November & April most precipitation falls as snow. In some years during the summer there are monsoon storms from the Great Basin that bring heavy rainfall especially to high elevations on the Northeast side of the basin. Each Autumn, mature kokanee salmon change color from blue to red and swim upstream near the Taylor Creek in South Lake Tahoe. There are two species of the kokanee salmon, and one spawns in streams and the other spawns near the shore. The Lake Tahoe Yellow Crest is a plant that grows in the wet sand between low and high water marks. It grows only in direct shoreline of the lake. The population size of the flowering plant change according to the water level of the lake, growing largest when the water levels drop. Freshwater Biomes are among the most important biomes for life's diversity. However, freshwaters are also among the areas most altered by human activities, especially by modern technology. Rivers and streams were heavily used as a way to dispose of wastes. A generation ago, waterpower was considered one of the "cleanest" and most environmentally forms of energy production. Waterpower remains one of the least expensive sources of energy. Many environmental threats plague freshwater biomes, from the draining of wetlands for development to the release of industrial waste into the surface waters. According to the U.S. Geological Survey over half the wetlands in the lower US States have been lost from the 1780s to 1980's. Protection and perseveration of the existing freshwater biomes is vital. A biome comprises the community of plants and animals that exist under climate conditions. Freshwater biomes have suffered mostly from pollution. 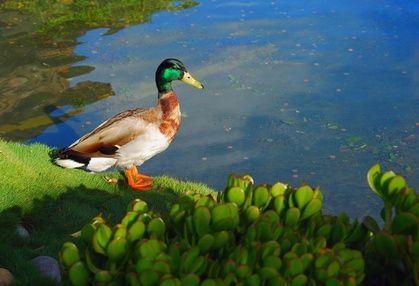 Runoffs containing fertilizer and other wastes and industrial dumping's enter into rivers, ponds and lakes tend to promote abnormally rapid algae growth. When these algae die, dead organic matter accumulates in the water. This makes the water an unusable resource and it ills many of the organisms living in the habitats. Strict laws have imposed to slow down this thoughtless pollution. expended to restore freshwaters. For example, the Missouri River, it became a major source of restoration. It is a new kind of National Wildlife Refuge, which is a series of meanders along the river, like beads on a watery string. Engineers and ecologists are cooperating to recreate the complex backwater habitats on these meanders, providing habitats for fish, birds and mammals. We can expect freshwaters to be a major focus of environmental conflicts in the next decades. Throughout much of the history of civilization, people have recognized the importance of freshwaters but at the same time rivers and streams were heavily used as a way to get rid of wastes. Waterpower was one of the 1st sources of non-biological energy and rivers have provided major transportation routes for people. Clean Water Act: this provides a statutory basis for the NPDES permit program and the basic structure for regulatory the discharges of pollution from point sources into waters of the U.S.
Other programs taking part in preserving freshwater biomes is the AIDA, National Geograpghic, and the National Radio Project.